Could OS X Be Your Next iPad? There have been several times where I have looked at my Macbook’s screen and thought, “OS X would look pretty cool on a tablet,”. Tim Cook, however, recently shot down that idea. Tim Cook was asked about a Macbook/iPad hybrid. He said, “Anything can be forced to converge, but the problem is that products are about tradeoffs, and you begin to make tradeoffs to the point where what you have left doesn’t please anyone,”. 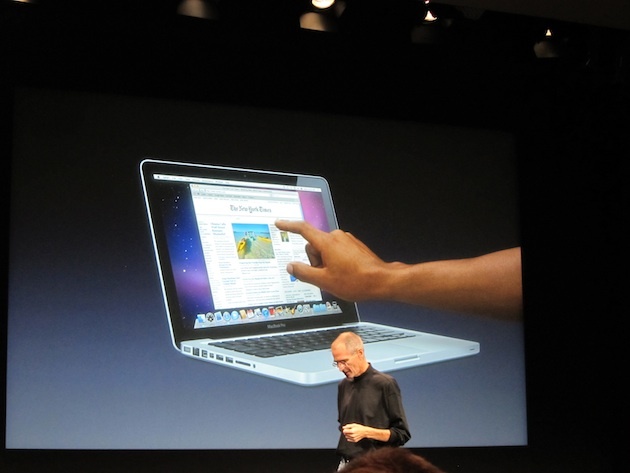 Steve Jobs mentioned that when designing the new Macbook Air, Apple had explored touch screens on their Macs. Compared to a mouse/trackpad and keyboard combo, however, the touchscreen on a laptop or desktop just doesn’t flow. Touch screens don’t want to be vertical. After using a propped iPad to watch YouTube videos, I can understand why; without some sort of backing, the device gets pushed back by your fingers when propped vertically, risking be knocked over. And when you have to do it constantly, it begins to feel tenuous. Pausing a video by tapping a vertical screen or switching to your email doesn’t feel the same as it does with a keyboard and mouse. I can’t imagine serious photo and video editors trying to manipulate precise cuts and effects with their fingers, no matter how much they would look like Minority Report. But all of this been the talk of a touchscreen laptop, much like the current wrap-around laptops, or what Microsoft has been planning with Windows 8. But what about a pure tablet? What about a Mac-Pad? A touchscreen Mac or a tablet Mac? Pro, not a tablet. I agree that a laptop with a touchscreen could cause problems, though a touch screen iMac might be cool. But we could apply the same thing to iOS at the moment. Many cool iOS appsand features would seem a lot more trouble with a mouse than on a touchscreen. While the trackpad can mimic many of these, it just doesn’t feel as immersive as a touchscreen. If a touchscreen Mac could succeed, the best would be in an iMac (or subsequently an Apple Display) or an iPad-like touchscreen only Macbook (hence the name Mac-Pad). Even with the speed and functionality of the iPad, there are still things that iOS struggles with. The office suites on iOS still leave much to be desired, as well as photo and video editing. Likewise, there are still a few websites that are using Flash or have yet to be optimized for a mobile device and don’t function properly. My father was applying for a job online with his iPad, but he couldn’t bring up the job application because the pop up window was oversized and could be zoomed out to fit on the screen. Internal company websites are also not optimized generally for mobile devices, and likely will take time to move in that direction. Having a laptop is nice for this, but some can be bulky to carry around and opening them just to wait on the OS to load can be a hassle, especially in very mobile professions, such as construction, medicine, etc. Having a tablet with a full-blown desktop OS would alleviate many of these problems. We’ve already seen it in Windows and Linux in the past and present. Likewise, both Ubuntu and Microsoft have already talked about tablet optimizing their operating systems (see Windows 8). Having the full power of OS X at your disposal in the convenience of an iPad. The Mac-Pad already has some drawbacks. First is the screen. A 10-inch screen looks great on iOS, but OS X would begin to feel cramped. One only has to look at the 11-inch Macbook Air to see that. Likewise, if a Mac-Pad wanted to keep the same specs as the 11 inch base model of the Macbook Air, it would likely be as thick, if not thicker than the iPad. For a 13 inch screen, and better specs, it might have to go bigger, especially given the heat it would have to disperse. If a user had to render a large video or picture file, or try some high end gaming, the Mac-Pad could overheat faster than an Air or Pro. All this jacks up the price noticeably and could hurt the chances of it coming to market. But let’s pretend Apple did succeed in making a Mac-Pad and solved the heat dispersion issue, the thickness, and how to keep the price down. Let’s pretend it replaced the 11-inch Air with the Mac-Pad, and kept it at the base price of $999. I imagine that while some Apple fans would buy it, and a couple of mobile professionals might buy it, but I have trouble believing that the public might buy it. What would prevent them from spending a few bucks more and buying a better, full blown Macbook Air, or even a Pro? Or they could save a few bucks and buy an iPad, which for the average user can serve many of their needs just as well as a Mac. Even buying the most expensive iPad from Apple is still cheaper than the cheapest Macbook. though Apple can be known for being radical and taking items out of their computer before the mainstream does, even they wouldn’t be crazy enough to sell a Mac without a USB port (at least, not yet). They would have to integrate it into the Mac-Pad, which would add to the thickness and weight, as well as potentially hurt the clean-cut design of a Mac-Pad. They could go with external dongles, but while dongles are not essential for an iPad to really function, doing the same with a Mac doesn’t sound ideal in the least. 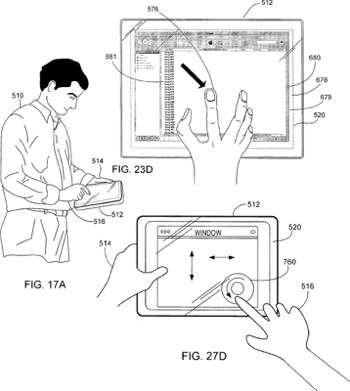 One last reason is the touchscreen integration itself. For this, I only have to turn to iOS and Android to prove this point. When iOS was created, it was built to be a touchscreen from the ground up. Almost every facet was designed to use the touchscreen, which is why iOS has been very good at giving fluid motions and quick responses to the touch of your fingers. Compare this to Android: Android was built on a keyboard and mouse interface originally to compete with its original competitor, Blackberry. When iOS came out, the game changed, and Android had to gain touchscreen abilities. Unfortunately, to integrate touch the same way iOS does, a good portion of Android would have to be rewritten. And as time has gone by, and Android has become more ubiquitous and more apps have been brought to the platform, that has become harder to do. So Android had to add touch capabilities on top of the OS as it already existed. While this gave it the ability to use a trackpad in things like the Asus Transformer, it meant that touch responsiveness has been an issue. Bringing this back to OS X, trying to get the same fluidity of touch from iOS to OS X would only be the same play on a different stage. Do I expect a Mac-Pad? No, certainly not any time soon. More realistic is some hybrid between iOS and OS X. Is the idea still cool? Yes. But then again, maybe I missed something. Maybe there’s a better reason for a Mac-Pad that I missed. Do you have a better reason that it could or could not exist. Let me know below. Leave a comment and tell us what you think. Email me at easyosx@live.com You can also check me out on Facebook, Twitter, and YouTube by hitting the buttons on the top of your screen. And be sure to check out my Google Plus. Thanks! Hi, found your article – just wanted to point out full working Windows 8 tablets are on the rise for about a year now, finally bringing the full OS experience with necessary power (4core atom as quite usable minimum), the “reign of android/ipads” as only viable option for professionals, students and even casual users is ending I think. For that reason I expect Apple to introduce some kind of mac-pad/air-mini quite soon, even this year, it’s only logical (unless they worry about self-competing). Just my 2c.